UPDATE: Andrea is happy to announce that Emmalee did find her forever home over the weekend. We hope her story of passion revisited inspires you. Two weeks ago, with the help of many animal welfare angels, I rescued a young female husky from the county shelter. She was picked up as a stray after a passer-by tried to strangle her with his belt. Undaunted that she was malnourished, had tick fever, ear infections and a mass nearly blocking her left ear canal, I made a commitment to her care and named her Emmalee. The kind owners and staff at Second Home Pet Resort allowed me to board her there at a much reduced fee, as my home is full with my three dogs. Shortly after arriving, Emmalee had surgery to remove the mass. She did very well, and the mass was benign, likely a result of untreated ear infections. She is being treated for tick fever, is symptom free, and will recover fully. And, she is enthusiastically eating healthy food and gaining weight. She is returning to her husky self – active, curious and fun-loving. Now, we wait for her perfect forever home to surface. And act of faith in action. Déjà vu. I am reminded of my feelings the last time I embarked on a journey like this one, and the words from my 2013 post seem fitting. It’s been said that we cannot think or act in love or in harm toward another without affecting, in some small way, all others including ourselves. This truth becomes more evident to me each and every day. We are all connected. What we think, say and do to members of our planet – people and animals, as well as our earth itself – has profound and far-reaching impact. Despite a full work schedule and many demands on my time, I am consumed by passion – compassion actually – for this sweet pup. And I know that many of you are equally consumed by passions of your own. Most all of us have some cause or mission that evokes a strong desire to contribute, make something better, or right a perceived wrong. We cannot help but be affected by circumstances that surround because we are in relationship to one another. We are connected. I love words, and writing gives me an opportunity to study them. The word “passion,” describes the drive to action I have felt, and the deeper feeling underneath is “compassion.” I was surprised to learn that the Latin root of the word passion is “suffering.” Compassion’s root is “to suffer with.” Ah, the addition of the word “with”… connection. My drive to help this one dog could easily be snuffed out if I allowed myself to become overwhelmed by the great need beyond her’s. I’m reminded of the well-known starfish story in which a young girl’s refusal to be discouraged by the limitations of her own small efforts inspired others to join in and help. This is how connection works. We inspire one another. What is your passion at this very moment? You need only to step out your own world for a mere minute and you’ll be able to feel it. Make a choice to meet suffering with love, whether through a simple kind thought or an action. You’ll inspire the same in others even if it’s invisible to you. It’s how it works. Emmalee is a very special soul who will make a mark in some human’s life. Do you need the sweetness of a grateful friend and the antics of a husky personality? Our girl needs needs a forever home with a husky-savvy family. Can you help by sharing this message? Seriously, there is something new here. I have a lot going on, yes. But I also have this emerging core value I’ve been attending to. I haven’t found a just-right word for it yet, but self-regard comes close. It’s a familiar state of being, one I’ve honed for years now. And even though I genuinely feel such things as self-respect, compassion for my own shortcomings, and deservingness, my behavior doesn’t always align. I often “dis”-regard my own needs in light of an abundance of things to do and people to serve. And so I get tired. Exhausted, sometimes. Earlier this year, I decided something has to give. And the answer, I knew then and know still, is not to simply do less. It has more to do with the quality with which I carry myself through life than the length of my to-do list. It has little to do with the amount of hours I sleep and is more about what I do with the hours I’m awake. Regard for my own needs is paramount if I am going to truly contribute in this life. In the last week, a friend (who knows of this new pursuit), has prefaced a number of statements with “If you’re not resting …” Each time I heard or read those words, I had a visceral reaction. I wanted to shout: “Of course I’m not resting, I’m busy.” Or, “I don’t need to rest – I’m energized.” At the same time I was thinking these thoughts, I was carefully managing my energy. Despite a packed work schedule, in the last three days I’ve made time for exercise, fun visits with friends, a great book, a good movie and a weekday lunch with Arthur. After examining my reaction to my friend’s implication that I needed “rest,” I understood it. It’s the word, and what the word connotes to me. How do you view rest? Is it an essential chore, or a delicious and deserved reward? How do you practice rest? Do you crash exhausted or plan the things that uniquely refresh you? 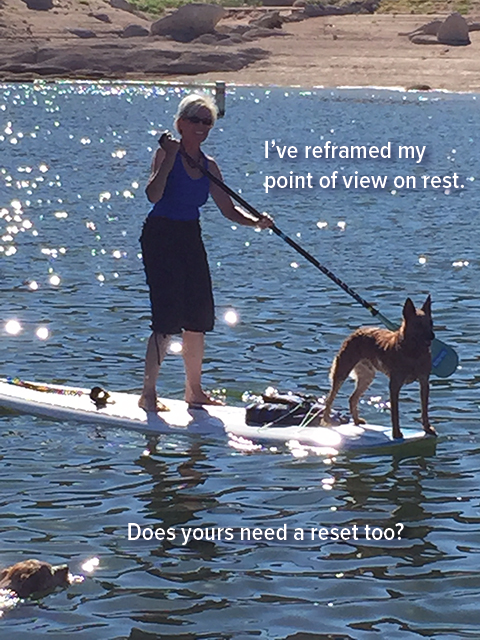 I’ve reframed my point of view on rest. Does yours need a reset too? Since the beginning of last year I’ve focused on managing my thoughts and staying present. This post appeared originally on The Spirited Woman where Andrea is a weekly blogger. Enjoy it! If you’ve been following my posts for the last few months, you’ve noticed a theme. Since the beginning of the year I’ve focused on managing my thoughts and staying present, and the practice, while imperfect, has been enlightening. Every now and then, somewhat counter to my natural style, I get organized. This week I’m organizing my “good vibrations,” and I thought I’d share an insight here, along with some really good news. In one post connected to that theme, I suggested that thoughts are prayers, directing the flow of apparently coincidental circumstances. In another related post, I told the story of my own passionate thoughts and feelings about a young Siberian Husky born without kneecaps and needing very expensive surgery to survive. Through that story, I hoped to inspire all of you to find feelings of compassion for something meaningful that you can affect in a small way, vs. feeling sorry or helpless in a world that seems to have no shortage of tragedy. I’m thrilled to report that the angels at Alley’s Rescued Angels in Los Angeles raised enough funds for the pup’s surgery and it was performed last week. Just one week later he is walking proudly, tail wagging, and has a bright future ahead. I am certain that the loving thoughts, prayers and well wishes from around the world played a significant role. Literally, caring individuals rallied in an effort to share the story and raise money. But maybe even more importantly, all of the loving thoughts served as healing medicine. You need only review Larry Dossey’s amazing work to know that is truth. Do you ever really ever doubt that we are all connected? Separation may just be the biggest illusion we face. And, if we are all connected, in my opinion we have we have responsibility to lift one another up through our thoughts and feelings for and about one another, vs. squandering them as is so easy to do. 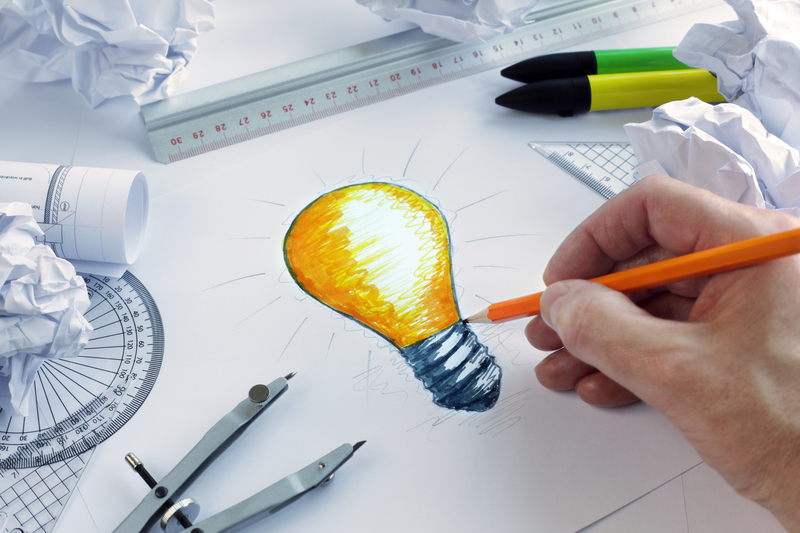 I ran across a fascinating study conducted by a Case Western Reserve University researcher. The research found that when the brain fires up the network of neurons that allows us to empathize, it suppresses the network used for analysis. It shows for the first time that we have a built-in neural constraint on our ability to be both empathetic and analytic at the same time. The work begins to explain the “emotionally engaged intuitive understanding which allows us to relate to one another as people.” (Or, I might add, other beings, such as animals). As I build my insights from my simple observation of thoughts and feelings I have a new focus for my practice: breathing. I don’t think I breathed at all the day of the pup’s seven hour surgery, even as I prayed with fervor. I’m exhaling now, present to the simple opportunity to connect and shape our collective experience. Join Andrea as she reflects back on Thanksgiving 2012. What are you most thankful for this Thanksgiving? I will officially begin celebrating the Thanksgiving holiday on Saturday when five friends arrive from Atlanta. As I prepare to enjoy time with them, I have begun to consider all of the things I am thankful for. And of all the wonderful blessings I have in my life, today I am most thankful for this one simple fact: I control my destiny. I have been working, of late, to maintain a positive and hopeful state of mind. When small but annoying setbacks happen in my life and work, I have sought to not sweat the small stuff, and when faced with negativity seemingly all around, I have practiced management of my own energy. I’ve even succeeded in maintaining a degree of perspective in the backdrop of natural disasters and political strife. While controlling one’s attitude is the ultimate source of control, it certainly helps to live in the land of the free. Last weekend I met Karen Keilt, author of The Parrot’s Perch. Her book is based on her own true story, and I was stunned by the account Karen gave of her experience as a young adult in Brazil. A privileged woman living a fairy tale life, she was falsely arrested, imprisoned, raped and tortured by extortionists. Most astonishing is that the laws in that country still protect those torturers from prosecution, and the egregious offenses are ongoing. 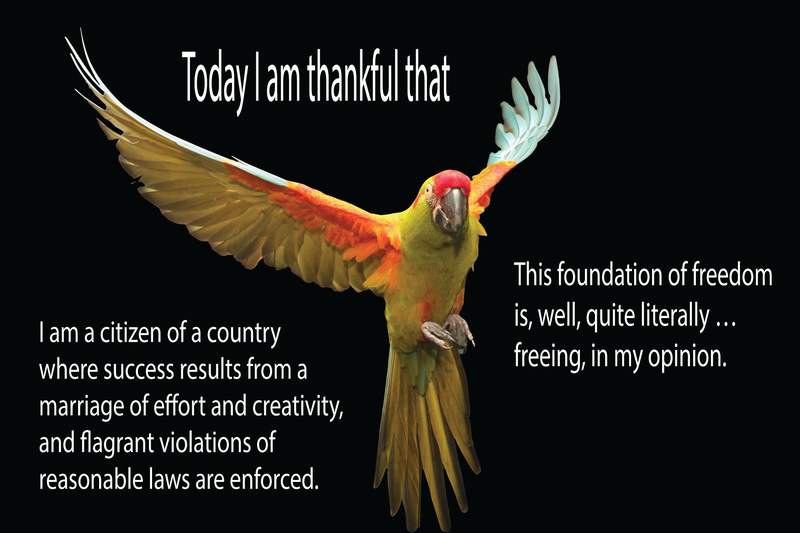 Today I am thankful that I am a citizen of a country where success results from a marriage of effort and creativity, and flagrant violations of reasonable laws are enforced. Most of us can rest at night with a general feeling of safety and wake up each morning with an opportunity to make this day better than the one before. This foundation of freedom is, well, quite literally … freeing, in my opinion. 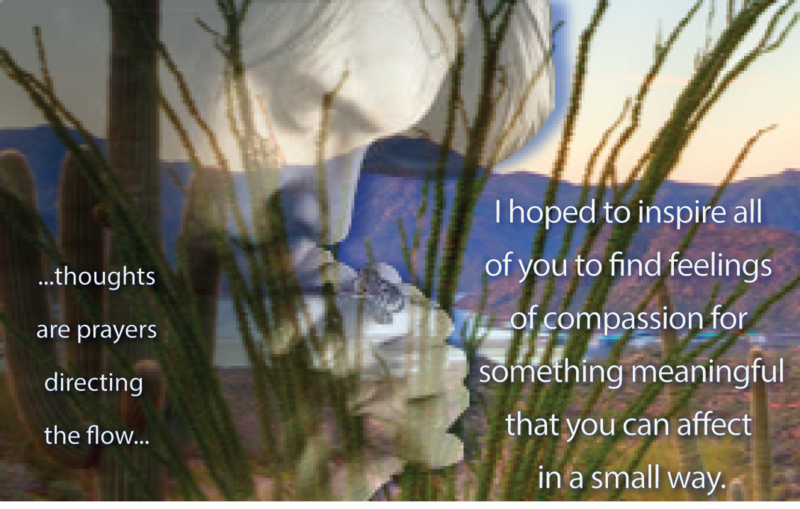 I am not Pollyannaish and I vow to never lose compassion for those who struggle. I am committed to remaining responsible for my thoughts, feelings and actions regardless of what’s occurring around me. Just for a moment, step outside your present circumstances, whatever they may be, and answer this question. What are you most thankful for? What conditions or situations afford you the opportunity to choose the life you wish to live? What present factors serve as the foundation for your courageous actions as well as attitudes? Remind yourself of these in this upcoming week of Thanksgiving.